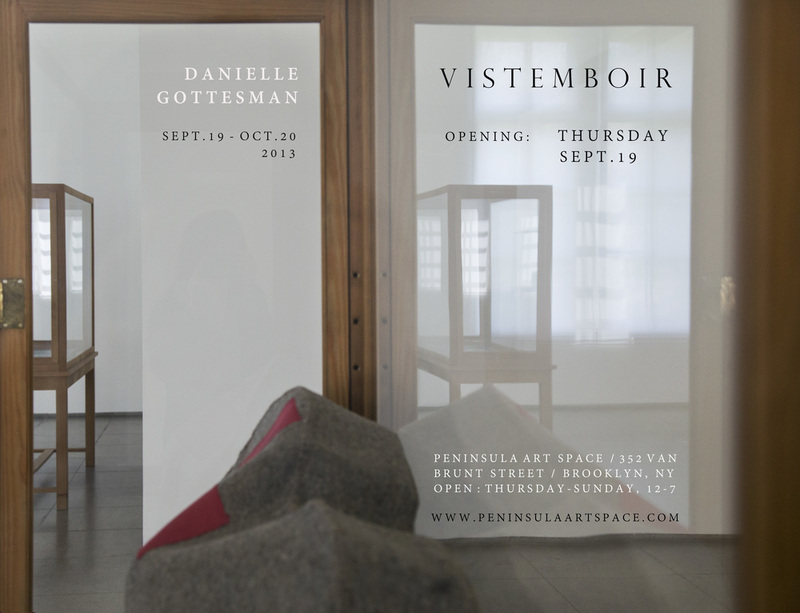 Peninsula Art Space is pleased to present Vistemboir* , Danielle Gottesman's first solo exhibition in the United States. The exhibition presents a selection of new work from the series Re:collect and Vistemboir , highlighting the range of Danielle Gottesman's practice. However multifaceted, the works in sculpture, etching, photography and video all seek to endow the familiar with a sense of ambiguity. Her interpretations of mundane scenes, objects, and symbols encourage the viewer to re-address the way we all choose to perceive our surroundings. Re:collect is a series of works that challenge our hermetic perception of art. Via photography and video, Gottesman captures, and to some extent, appropriates the works of artists in order to reflect her experiences within domestic and gallery settings. Through the camera lens, the works are abstracted yet personalized, revealing fleeting memories that highlight the layered experience of an art work. Vistemboir is Gottesman's answer to skeuomorphic design, which has been in practiced long before the digital age, but has now become ubiquitous in daily life. Its contemporary role is to render software more user-friendly by introducing symbols that emulate objects in the physical world. Interestingly, these symbols (digital skeuomorphs) often emulate tools that are now obsolete - tools with which todays younger generation may, in fact, be unfamiliar. To these generations - the artist's generation - such objects have come to adopt symbolic meaning and are, as a result, increasingly hard to define. Through further development of project Vistemboir , Gottesman hopes to kindle a modern sense of collective nostalgia. Misperceived as historical artifacts - yet inspired by digital icons - her works insinuate a forgotten purpose, yet defy logic. The sculptures balance between the realms of anthropology, technology, and fiction, as we attempt to reconcile our understanding of the real in an age that is increasingly virtual. Danielle Gottesman was born in the UK in 1990, and raised in both Israel and France. In 2012, she graduated from Central St Martins School of Art and Design (London) with a BA in Fine Art. She has had several group exhibitions in London, and recently, a solo exhibition in Amsterdam. The artist now lives and works in New York City. noun. a term coined by Jacques Perret (Le Machin , 1955), referring to a banal yet mysterious object - one that seems to possess neither name nor function, but remains oddly familiar.